If you have visited TheDeathlings.com before, you will see that things here have changed. 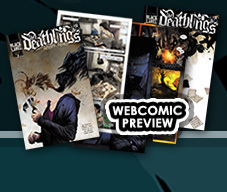 It's now part of a larger, much more complete site, featuring all of our comics-- but it's still the best place to learn about the world of The Deathlings (and the comics) and to read previews of "Anne's Story" and our short comics. If you're new to The Deathlings, I should explain... It is a series of comic book stories taking place in a world where patchwork constructs, the Deathlings, wage war against all of the undead in every universe-- but all too often, where innocent lives get caught up in those battles. Our first series, "Anne's Story" follows a fairly normal girl, starting on the day she dies, and explores her journey to discovering that her new powers over life and death can't solve a lot of her real-world problems. Why don't you check our our free webcomic preview? We also regularly produce short (2-12) page stories, exploring other characters-- the powerful Ani and her army of compassionate rebels, the refugees lost in a foggy world of decay and zombies, a nameless Deathling cowboy, and a lot more. After a year of work, Black Label Comics have not only produced the first issue of our first ongoing series The Deathlings: Anne's Story, we have also published our first double-size anthology, Black Label Comics #1. We thought it was time to put together a proper website. It will be the home on the web for my writing, and the best place to read about (and see the gorgeous art from) any of our comics. 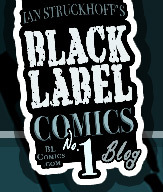 It will be a blog, with our perspective on making comics, news about the books, and more. We want to make the page worth looking at, so we promise it won't just be about our own work. You'll see articles by me, the artists, and our colleagues on the comics industry, reviews, our idols and friends, and so on. It will also be-- and we know this is ambitious-- at least three webcomics. We plan to update The Deathlings often as a webcomic, with previews of our first issue, plus short comics. (Once the schedule is finalized, we will let you know.) You will also be able to read a preview of Huginn & Muninn. Finally, we hope to make all of The Dark Age available as a webcomic, one page at a time. If you hunt around the site, you'll find a lot more. There's info on all of the comics, an art gallery, and more. Soon we will have a shop, so you can order our comics directly. If you are interested in our books, be sure to visit the links to our Kickstarter, Facebook, and DeviantArt pages. 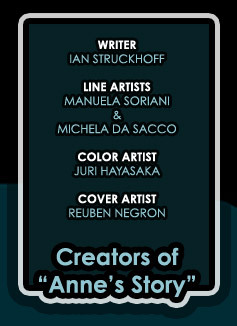 You can pre-order the comics on our Kickstarter page, or visit us in person at New York Comic Con.